Based at the University at Albany’s Rockefeller College of Public Affairs and Policy since 2007, SUNY/CID combines knowledge with the practice of government and policy-making to aid foreign countries in strengthening and developing their legislatures. SUNY, UAlbany and Rockefeller College resources; field offices on five continents; and links with donor agencies, local and national governments, institutions of higher learning, and other partners have enabled the center to merge projects with a government-focused research agenda. As a result, SUNY/CID has implemented more than $200 million in international development projects over the past quarter-century while forging strong relationships with legislative bodies around the globe. “We’ve had a great impact,” noted M. Monica Bartoszek, the center’s outreach coordinator. “We’ve developed a really solid reputation for the work that we do, legislative strengthening and other projects in Bolivia, Afghanistan, Lebanon, Haiti, Kenya, Uganda and many other countries.” SUNY/CID training, Bartoszek said, is comprehensive, encompassing “everything from HIV/AIDS education and computer training to learning how to organize public hearings for parliamentary committees.” Projects range in duration from six months duration to 10 years. The "many scholars, both staff and visitors," Blakeslee has encountered "have taught me a great deal and have shared eye-opening firsthand perspectives on development work." 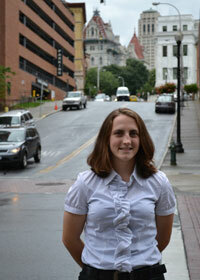 Now studying for her M.P.A., Blakeslee, 21, began her internship in September 2010. In the year since, assigned to the home office in Albany, she has “updated our Web site, reviewed financial reconciliations, done all types of research, helped coordinate travel plans, worked on document management and assisted with media outreach. With each task, I learn something and gain a new perspective and understanding of the work we do at CID. I have been able to take theories I learned in a classroom and apply them to real people and real situations. Study tours, like this USAID-funded Promoting Democratic Institutions and Practices Project (PRODIP), jointly implemented by SUNY/CID and The Asia Foundation, offer an upclose view of U.S. legislative practices and an opportunity to speak with constitutional experts. 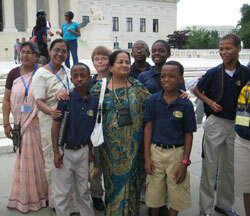 Here, a group of members of the Parliament of Bangladesh mingle with students outside the U.S. Supreme Court. 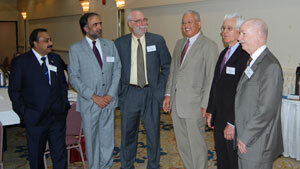 For information about upcoming events commemorating SUNY/CID’s 25th anniversary, please visit the center’s Web site. Search internship opportunities at www.cid.suny.edu. "A Victor, not a Victim"
Born without a left hand and with diabetes, Eddie has tackled both challenges head on. Read more.